The Open-centre turbine is an innovative turbine designed by the Open Hydro Group. A prototype was installed at the European Marine Energy Centre in Orkney in 2006. In May 2008 it became the first tidal turbine to contribute to the UK grid. 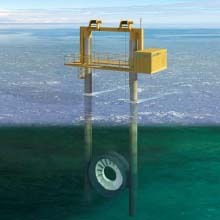 The OpenHydro machine is a large underwater turbine, resembling a jet engine, fixed to the sea floor. OpenHydro is built by Cantick Head Tidal and will harness the firth's fierce tides at a 200MW site south of Orkney.